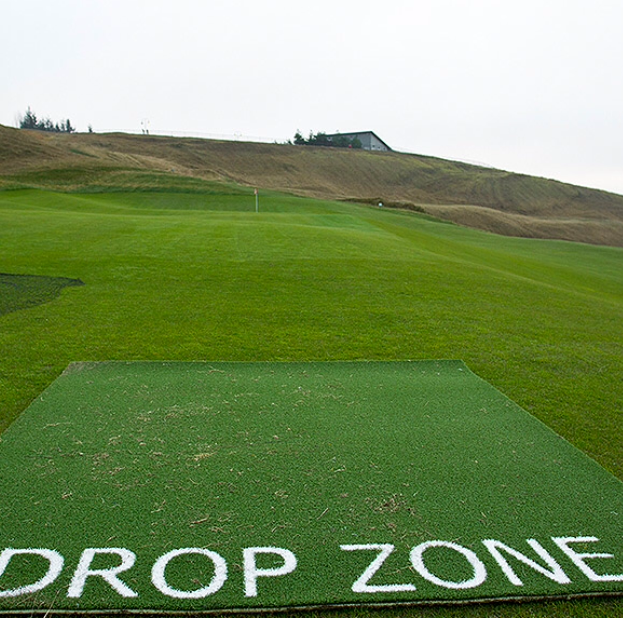 The brand new EZTee® Hybrid Plus tee line system, installed at Chambers Bay in January. 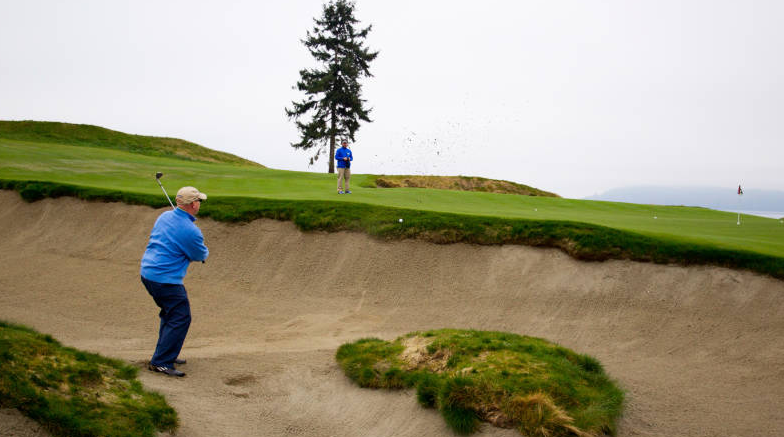 When the 115th U.S. Open at Chambers Bay kicks off Thursday, competitors in University Place, Washington will be playing on some unique fairways and greens. The course is made entirely of Fescue grass, which is a type of grass not seen on putting greens at the U.S. Open before. It will play harder and faster than traditional fairways in the U.S. The greens are rumored be be sitting around 12 on the Stimpmeter. The fairways are rolling at an eight. The folks at Chambers Bay wanted to protect the course over the winter months from heavy play and usage that could potentially damage the course. So they employed a few tricks to keep the fairways and greens looking nice and green. First, they installed a brand new EZTee® Hybrid Tee Line System (above). This allowed the players who wanted to get a first hand glimpse of the course before the tournament to have a place to warm up and practice without damaging the natural practice tee area. One of the 12 drop zone mats STI provided for Chambers Bay to help protect fairways in anticipation of the 115th U.S. Open. Next the contacted Synthetic Turf International for some help in their fairways. Many of the fairways made use of these Drop Zone Mats (pictured below). 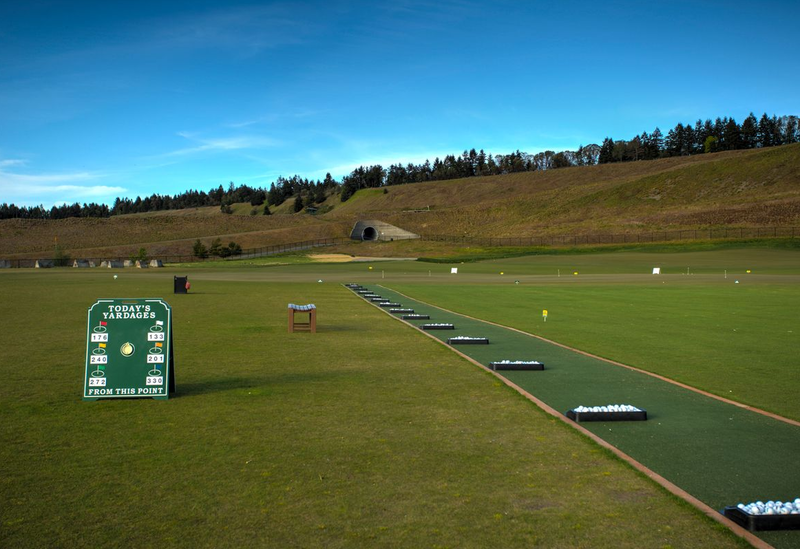 The mats were used for players who hit their balls into select fairways. They would pick up their ball and place it on these mats to hit their approach shots into the greens on 12 holes. Chambers Bay also used another strategy to keep the high number of players from damaging their greens on the Par 3 15th. The greens crew assigned an attendant to the green. Players who hit their ball onto the green were given an automatic two putt par. Players who hit their ball within 10 feet were given a one putt birdie. The attendant would retrieve balls hit onto the green so that there was minimal foot traffic on the green. The iconic tree, the only one on the course at Chambers Bay, looks over the Par 3 15th green. This ball might not have made it onto the putting surface. This should be a memorable year for the U.S. Open at Chambers Bay. The tournament is seldom played on a links style course, and never on one quite like this.